All of Daytona’s circuits are offering amazing deals on Bank Holiday Monday – you can enjoy 20% off at our Milton Keynes and Sandown Park venues and you can drive for just £20 inc VAT at Tamworth and Manchester! Junior drivers aged 8-15 can enjoy savings on 20 and 25 minute Arrive&Drive sessions at all of our circuits, whilst Senior drivers will enjoy savings on Arrive&Drive at all tracks – including the amazing DMAX-GT karts at Daytona Tamworth – and 20% off Open Races at our Milton Keynes and Sandown Park circuits. 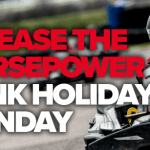 Please note that DMAX karts are not included in the Bank Holiday offers at our Milton Keynes and Sandown Park circuits. Our offers are valid for adult and junior events throughout the day on Monday 27thAugust but spaces are strictly limited – so click here to check availability and prices and to reserve your spaces online. You can also call us on 033 033 27870 for more information.